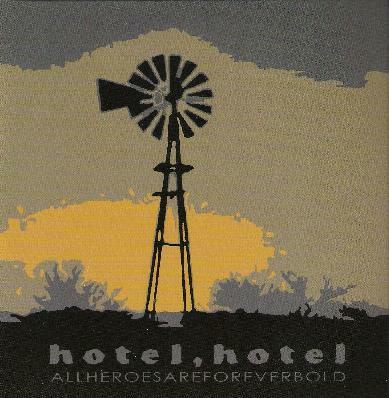 Hotel, hotel - "All heroesareforeverbold"
Hotel, hotel "ALLHEROESAREFOREVERBOLD" AN INSTALLATION IN SEVEN STAGES Wow, what an impressive release, the band's first. It's a CD of intense, driving, ambience. DENIAL 4:59 Nice, full, sonic sound, bells and chimes and guitars. This isn't the most original music ever but compared to hundreds of sleepcore rock bands over the last 10-12 years this is beautiful music played with passion. SHOCK 7:13 Ummagumma drums, viola drones, very nice. The entire CD is one long piece of music... "a Texan three-piece, somewhere in the realm of an ambient/drone/instrumental/post-rock band, formed by chance in the summer of 2005". ANGER 2:34 Nice, quiet, atmoshpheric violin. This is the kind of CD you can listen to over and over and it sounds better each time because it's tastefully done. It has a nice feel/energy. BARGAINING 10:08 Really beautiful. I'm happy there are no anguished male vocals to muck it up, no vocals at all... beautiful and meditative. GUILT 4:57 Loud rawk dude, but still cool. Reminds me of old F/i. Hotel, hotel is Caverninha - drums; Misco - violin; Chaos - guitar. They have already toured Texas and the United Kingdom. DEPRESSION (IT IS WHAT IT IS) 3:34 Back to the quiet, reminds me of Sigur Ros. ACCEPTANCE 9:57 More of the same. Overall very impressive, a goodvibe, feelgood CD, even with the depressive song titles. Keep it up, you have a future. For more information you can visit the Hotel, Hotel web site at: http://www.lo-bango.com/hotel.